.This author uncovers a heretofore virtually unknown loudspeaker crossover design that offers both linear phase and flat frequency response. As you know, a single loudspeaker driver is simply incapable of reproducing the entire 20 to 20kHz frequency range. The physical qualities needed at one frequency extreme are the exact opposites of those needed for success at the other extreme. So you are left with basically two choices: either use a single (so-called) full-range driver and accept some loss of response at both the high- and low-frequency extremes along with a loss of dispersion in the higher frequencies, or choose to “divide and conquer” with crossover filters and multiple drivers, which will allow you to cover a much wider frequency range with better overall dispersion. However, almost all crossover networks introduce their own problems either in the form of frequency and/or phase aberrations, or have rolloff slopes that are much too shallow to be very useful. Fortunately, there is one type of crossover that you can use to produce a multi-way system with flat frequency response, linear phase response, and useful crossover slopes. First look at the full-range driver option. This choice is appealing not only because of its simplicity, but because a good full-range driver has the ability to sound smooth and very cohesive. This cohesiveness is likely due to the very fact that the full-range speaker system has no crossover. With no crossover network to disturb its phase characteristics, the driver’s phase curve, while it isn’t flat, is continuous, smoothly changing through out the driver’s bandwidth from a phase lead at the low frequency end, moving through 0-degrees somewhere in the midband, and finally ending with a phase lag in the higher frequencies. Among conventional crossovers, there are many choices, and each type has its problems. 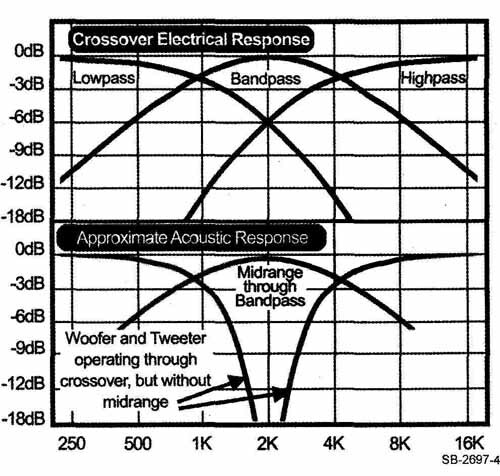 While first-order crossovers have linear frequency and phase response, they are difficult to implement in a system because their shallow -6dB/octave slopes require the tweeter to with stand significant power below the cross over frequency, and they need smooth response from both the woofer and the tweeter well beyond the crossover frequency to maintain a flat summed response. Depending on the phasing, 2nd order filters result in frequency response with either a sharp null at the crossover frequency or a +3dB rise. 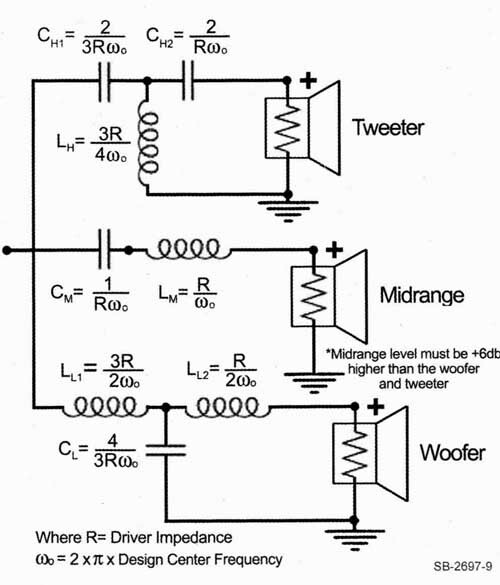 A 3rd_order filter can give you flat frequency response, but not linear phase. Likewise with both and 4th Linkwitz-Riley crossovers. The unique and little-known cross over presented here is alternately known as a Kido-Yamanaka, or “Filler Driver” crossover. It exhibits both flat frequency and phase response giving the speaker system the potential for real waveform fidelity limited only by the characteristics of the individual loudspeaker drivers used in the system. It is a three-way net work that uses 2nd-order slopes for the woofer and the tweeter plus first-order slopes for the midrange. The outputs of the Yamanaka crossover’s low, mid, and high frequency bands can recombine electrically to form a perfect replica of the input signal and can pass perfect square waves (Fig. 1). Some would argue that you don’t listen to square waves, and speaker phase response is irrelevant. I’m certainly not interested in listening to square waves either, but would you consider buying an amp that was incapable of reproducing a decent-looking square wave? Why should you give your speaker systems a free pass when it comes to waveform accuracy? Both frequency response deviations and phase shift are linear distortions of the input signal, and all else being equal, a speaker system that minimizes these errors is more accurate than the one that does not. With the Yamanaka crossover and good drivers, other parameters are not sacrificed and the result is simply better sound. I hope you will be encouraged by the knowledge of this crossover design to take up the noble goal of full speaker waveform fidelity. FIGURE 1: A square wave signal (Di input to the Yamanaka crossover network is split into three passbands: low (A), band (B), and high (C). Because this type of crossover has perfectly linear phase and frequency response, the three bands have the ability to recombine into an exact replica of the original square wave input signal (D). I first became aware of the Kido-Yamanaka linear phase crossover network in the mid 1970s while managing a stereo store when one of the store’s buyers brought back a brochure from the Consumer Electronics Show about a new line of speakers that had been introduced by Technics. The flagship model was the SB-7000, a large three-way system with staggered driver spacing that claimed to have a linear system phase response. The brochure showed good acoustic square waves reproduced by the speaker system, along with oscilloscope photos of actual music waveforms into and out of the speaker: a trumpet blast, drum beats, and piano chords. It was practically impossible to tell the difference between the input signals and the speaker’s output. I requested a pair of SB-7000s for audition, evaluation, and a little reverse engineering. When they arrived I found that the Technics SB-7000s—though far from perfect—had very good resolution and a solid cohesive sound much like a crossover-less full-range system. I was intrigued enough that I disassembled one of the speakers, removed its cross over, snuck it into the business office, and photocopied the circuit board so I could trace out the crossover circuit. The PCB held well over 16 components—six for the three filter sections, ten Zobel elements to flatten the driver impedances so the filters would work correctly into resistive loads—plus an assortment of other parts for level adjustments. From the complexity of the crossover, I could tell that there was much more to this “Linear Phase” thing than just marketing hype, and the speaker left a lasting impression on me as I later went on to design speakers professionally. The Kido-Yamanaka crossover was first described by Bunkichi Yamanaka of Matsushita Corp. (Panasonic) in 1967. The following references give a full mathematical treatment of the Yamanaka crossover network and design method. (Note that this crossover is patented and its commercial use is restricted.) The first reference is by far the most thorough and informative. 3. Engineering Brief, Eric Baekgaard, “A Novel Approach to Linear Phase Loudspeakers,” May 1977 issue of the AES Journal. Bunkichi Yamanaka realized that subtractive crossovers could theoretically produce all manner of perfect crossover functions, but they require active implementation and multi-amplifier systems that were considered too expensive to have the mass-market appeal desired by a corporate giant like Matsushita- Panasonic. As mentioned before, a conventional 2nd-order crossover with the high- and low-pass sections summed in phase results in a response with a deep notch, or null, at the crossover frequency. Yamanaka used the subtractive crossover method to restore the response lost to this cancellation. Yamanaka’s associates, Ishii and Takahashi, replaced the active subtractor with a simple passive circuit and added it to a conventional 2nd_order crossover, eliminating the requirement for multiple amplifiers (Fig. 2). The complex math in Fig. 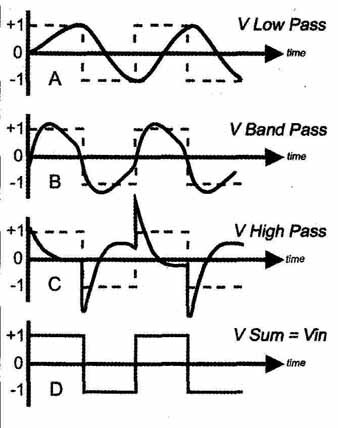 3 shows the bandpass function that is required to restore flat response after the low-pass and high-pass functions are subtracted from the input signal (Vin). Simply stated, a Yamanaka dividing network is a conventional two-way 2 order crossover network connected with both drivers in electrical and acoustic phase, which causes a cancellation in the overlapping range of the woofer and tweeter outputs. To this is added a mid range driver, also connected in phase, fed by a bandpass filter centered on the same frequency, which fills in the void (Fig. 4). When the combined acoustic outputs of all three drivers are positioned so that they are time adjusted and each of their signals blend together arriving at the listener’s ear at exactly the same time, the resulting acoustic waveform will be flat in frequency and phase response, limited only by the imperfections of the individual drivers. Eric Baekgaard of Bang and Olufsen Co. published an Engineering Brief in the May 1977 issue of the AES Journal showing an identical circuit, with the only difference being a scaling of the filter Q from .5 in the Yamanaka design to .707. Because the level at the crossover point is given by the formula 20Log(Q). in the Yamanaka version the electrical crossover between the woofer and tweeter is at 20Log(.5) = -6.02dB, and -3.01dB in the Q= .707 Baekgaard version. Baekgaard coined the very appropriate term “Filler Driver” for the midrange speaker used with this type of crossover network. He also showed that an alternate version was possible using 3rd_order filters for the low and high passbands. However, Baekgaard’s 3rd_order version requires the midrange level to be +6dB greater than the woofer and tweeter levels in order to achieve flat response. The circuit and formulas for Baekgaard’s 3 order filler driver crossover are included at the end of this article. 3. Each driver must be positioned in space so that all frequencies in each driver’s passband arrive simultaneously at the listening position. Fortunately, the Yamanaka crossover meets criterion No. 1. Criterion No. 2 need only be approximated, and No. 3 can be approximated over a relatively wide range of frequencies with proper driver positioning. While the phase shift inherent in all loudspeaker drivers prevents you from ever achieving perfection, Fig. 5 shows that the actual phase response of one system designed using the Yamanaka method was able to achieve linear phase within ±10° from 400 to 5400Hz and ±25° from 225 to 15kHz. This is better performance than even most full-range drivers are able to attain. The system design begins with the simultaneous selection of the drivers and a design center/crossover frequency, which I will call the Design Center Frequency (DCF, Fig. 6). The woofer and tweeter are chosen as you would if designing a conventional two-way system, and their crossover frequency is also the DCF, chosen to be in the center of the mid range driver’s linear operating range. The DCF is therefore the center frequency of the midrange bandpass filter, and is the only frequency used in any of the calculations of filter values. Those formulas are included in Fig. 2. FIGURE 3: Equation for the bandpass filter required to restore the missing response in a conventional two-way 2nd-order crossover. FIGURE 2: Sample Yamanaka three-way crossover network based on a Design Center Frequency (see text) of 2kHz, 61) impedance equalized speakers (nominal 8-ohm)), and filter Qs of 0.500. FIGURE 4: The top group of curves shows the electrical response of the Yamanaka three-way crossover’s individual frequency bands: lowpass, bandpass, and highpass. 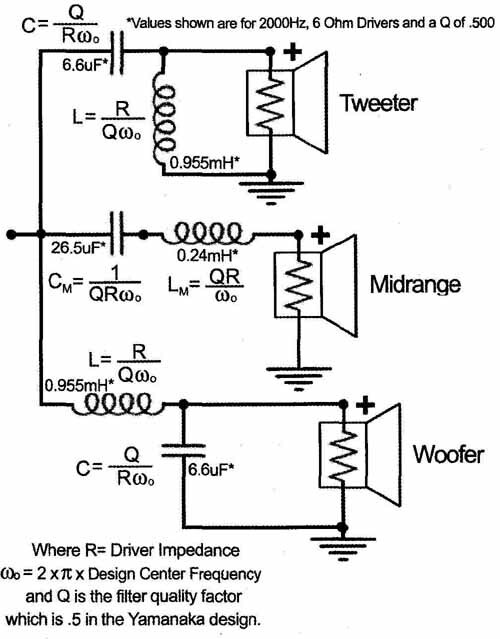 Note that 2kHz is both the crossover frequency between the woofer and tweeter and also the center frequency of the midrange bandpass filter. The lower group of curves shows the output of the speakers driven through the crossover. The woofer and tweeter operating together causes an acoustic cancellation at 2kHz which is filled in by the midrange speaker driven through its bandpass filter. With all three drivers operating through the crossover, the system has the ability to sum to flat frequency response and linear phase within the limitations of the loudspeaker drivers. 1. The DCF must be high enough above the resonant frequency of the tweeter to prevent excessive acoustic phase shift in the tweeter from making system alignment difficult or impossible. An octave is adequate. 2. The DCF must be high enough to prevent the likelihood of tweeter dam age from low frequencies not sufficiently attenuated by the crossover network. 3. The DCF must be high enough that the tweeter’s unfiltered response is not excessively rolled off in the desired passband and transition to the stopband. 4. The DCF must be in the central range of the mid range driver’s linear operating range. 5. The DCF must be low enough that the woofer’s unfiltered response is not excessively rolled off in the desired pass- band and transition to the stopband. That may seem like a tough list at first, but the criteria are not really that hard to satisfy with good quality drivers, and the results are well worth the effort and expense. The most stringent requirements are for the tweeter, where the example’s DCF of 2kHz re quires a tweeter with a resonance of about 1kHz. With filter Qs of .500 the tweeter crossover is ±-6dB (.25X system input power) at the DCF, -14dB (.04X system input power) at .5DCF, and -24dB (.004X system input power) at .25DCF, so the tweeter is not going to be taxed terribly hard if the crossover is properly terminated and allowed to attenuate as intended. The DCF can be shifted higher (or lower) as long as the woofer’s dispersion extends to match the higher DCF. The example (Fig. 2) has the actual crossover component values that were used in the Technics SB-7000 speaker system for a DCF of 2kHz, Q of .500, and drivers that had their impedance curves flattened with impedance equalization networks to approximate 6-ohm resistors. FIGURE 5: Actual measured acoustic phase response of three-way speaker system using Yamanaka linear phase crossover network. Note that individual chart divisions are 10’ and that the phase response is actually ±10’ the critical middle range from 400-5400Hz. 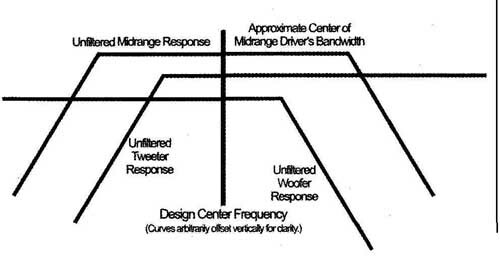 FIGURE 6: The system is designed on a Design Center Frequency which is chosen to be in a range that is overlapped by the unfiltered response of both the woofer and the tweeter and is also in the approximate center of the midrange speaker’s unfiltered response in the enclosure or sub-enclosure in which it will be used. In the chart the relative levels of each band have been separated vertically to make them easier to visualize. It is optimal that each of the speakers have smooth, extended response as a starting point, without any serious peaks or dips in the range to be left unattenuated; however, this design is no more, or less, critical than any other design in this regard. The midrange driver should be a good-quality wide range unit in its own sub-enclosure large enough to keep its resonance low, as the midrange will be responsible for an important part of the system output and you want its response to be reasonably flat. Its phase response will probably be reasonably close to 00 through that range and the system phase will be, too. Crossover networks work properly only when they are properly loaded with an impedance that matches the one for which they were designed. So unless the crossover sees the proper impedance load, at least in the important frequency ranges where the crossover is required to attenuate, the crossover will not perform as required. A loudspeaker’s true impedance is a combination of resistance and reactance that varies widely with frequency, matching its nominal value at only one or two spot frequencies. A dynamic speaker in free air, in a closed box, or a closed back tweeter, will display a single large peak in the lower frequency end of its impedance curve due to its resonant frequency, and an increasingly rising impedance in its higher frequency range due to the inductance of its voice coil. Wherever the impedance is higher than the crossover design value, the crossover will attenuate less than desired. 4. the tweeter’s impedance peak caused by its resonant frequency. Erik Baekgaard of Bang and Olufsen showed that a 3d-order filler driver system is also possible. The same methods and requirements go into its design with one very important difference. In order for the 3 order filler system to sum to flat frequency and phase response, the output of the midrange driver must be +6dB higher in level than the woofer and the tweeter, If this condition is not met, the frequency response will droop in the midrange. Figure 9 is the schematic for the 3rd order version of the crossover and formulas for the passive components. FIGURE 9: Linear Phase “Filler Driver” crossover using 3rd-order filters for lowpass and highpass filtering. This alternate circuit was described by Eric Baekgaord of Bang and Olufsen and requires that the midrange driver be operated at a level +6dB higher than the woofer and tweeter for flat response. Otherwise the design process for this crossover is the same as for the Yamanaka 2nd-order network described in the text. The impedance rise due to resonant frequency of the woofer and the rise due to the inductance of the tweeter’s voice coil do not affect the crossover’s operation and can be safely ignored. If the tweeter resonance (4.) is highly damped, you might ignore it, too. When fixed resistive pads, or continuously variable L-pads, are used to balance the sensitivity of the midrange and tweeter drivers to equal out and match their volume levels to the sensitivity of the woofer, the effect of the impedance variations of the midrange and tweeter on the crossover network will be lessened to some extent. It is worthwhile to make this level adjustment first and then measure the impedance curve and see whether Zobel networks are still needed to produce a nearly constant resistive load for the crossover network allowing it to attenuate as required. In my passive implementation of the Yamanaka system, I use Radian compression drivers for the midrange and tweeter, and installed fixed resistor L-pads to bring down their levels. Because the compression drivers are so much more efficient than the woofers, the resistive L-pads are completely effective in isolating the crossover from the actual impedance variations of the drivers. If the woofer or midrange voice coil inductance is unknown, you can determine it by measuring the impedance at a high frequency between 10kHz and 20kHz with a sine wave generator and an AC volt-ohmmeter. The formula in Fig. 7 gives the value for the voice coil inductance, LE, in henries, where FM = the frequency at which the measurement of impedance is taken, M is the measured Magnitude of the impedance at that frequency in ohms, and RE is the speaker’s voice coil DC resistance in ohms. FIGURE 7: You can calculate LE, the inductance of a driver’s voice coil, from this formula by measuring the value of its impedance in ohms at any high frequency in the 10kHz to 20kHz range. In the formula, M is the magnitude of the impedance in ohms, RE is the voice coil DC resistance in ohms, and FM is the frequency at which the impedance value was measured. FIGURE 8: Circuit and formulas for driver impedance equalization, after Robert M. Bullock Ill, Speaker Builder 1/85. 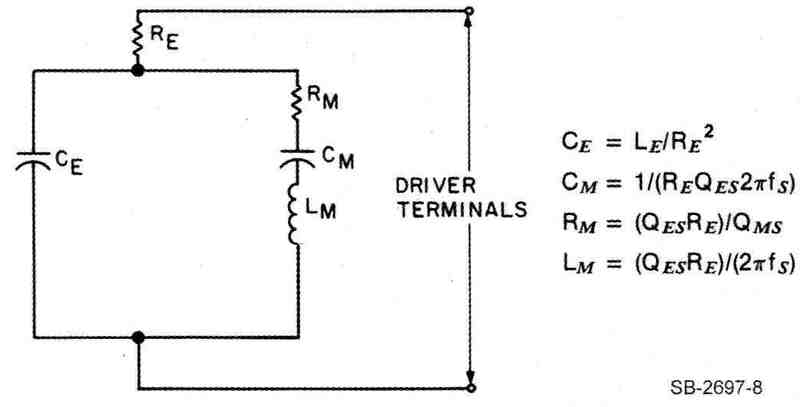 You can use this circuit to flatten the driver’s impedance curve to closer resemble a resistive load and allow for proper crossover operation. Component RE models the voice coil’s DC resistance and CE nulls the voice coil inductance LE. Components RM, CM, and LM null the single resonant peak like that of a speaker in a closed back tweeter. The most effective way to avoid the problem of driver impedance variations and sensitivity differences that complicate the design of passive crossover net works is to make the crossover an active one instead. This allows the use of filters containing precision resistors and capacitors working into close tolerance, resistive loads, without the need for large, expensive, power-robbing inductors. In the next installment I will present an active vacuum tube version of the Yamanaka crossover circuit, and conclude with an article describing proper setup and alignment of both passive and active systems using the Yamanaka crossover network. Author of this article, Steve Stokes, caught the hi-fi bug while in college when he encountered a friend’s system off our JBL LE-15 woofers, LE 375 midrange, and LE-85 treble compression drivers driven by a 200W amplifier and fed by professional Ampex recording gear. * After college he took a part—time job selling stereo components, soon became the store manager, and decided to stay in the audio field. He soon left sales and began designing home speaker systems as the Chief Engineer of Lancer Electronics (originally part of Soundcraftsmen) for the following 20+ years. He also served as the Director of Technical Information for Trusonic Corp. when it was relocated to Fountain Valley, Calif in 1978. He is a former member of the AES and the co-inventor of US Patent No. 5,212,732 for a Dipole Speaker System for Surround Sound. He enjoys designing and building vacuum tube electronics and digital SLR photography. *As an interesting side note, the friend’s 15ft speaker cabinets were built for him by Warner Bros. recording engineer Donn Landee (Doobie Bros., Van Morrison, Van Halen, etc.) and Dennis Dragon, who was an occasional tour and studio drummer for the Beach Boys and the Byrds, the recording engineer for his brother, Daryl Dragon of the Captain and Tenille, and the son of famous Hollywood Symphony Conductor Carmen Dragon.